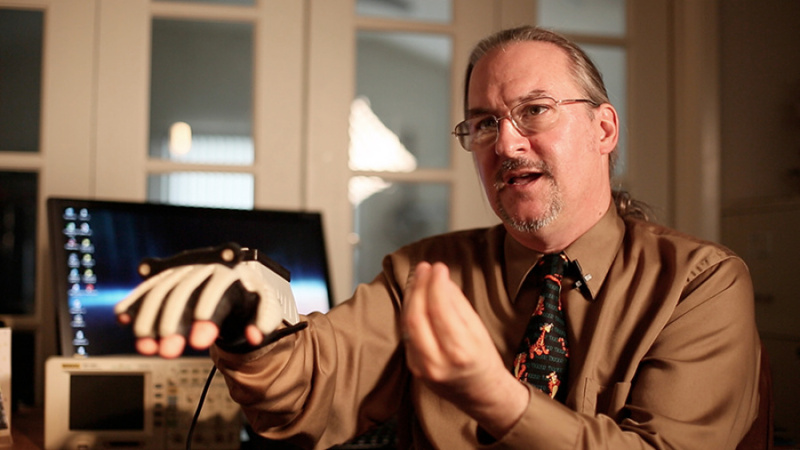 Before the Wii revolutionised motion-controlled gaming, there was the Power Glove. Developed by Abrams Gentile Entertainment, this unique controller would find fame in Hollywood movie The Wizard, but in reality was something of a critical and commercial bomb — it was awkward to use and, according to its creators, was something of a "compromise". Even so, the device is so iconic that a documentary has been made which not only charts its development, but also attempts to explain the enduring appeal of what is unquestionably one of the worst peripherals in gaming history. Filmmakers Adam Ward, Andrew Austin and Paula Kosowski have not only spoken to members of the team which designed the controller, but also to those who continue to treasure it today — including Nintendo super-fan Isaiah "Triforce" Johnson and musician Side Brain. You can check out the trailer below, and don't forget to visit the official site as well. "I LOVE the Power Glove... It's so bad!" No matter how bad a peripheral it was, it was an excellent advertising tool along with B.O.B and the light gun for the NES. To an 8 year old nothing was cooler than the commercial with the kid waving his gloved hand around for some reason or another to sort of control a video game. It was the first Wii mote... It didn't work very well though, so I see why it flopped hard.. No software was developed for it, it was just shoe horned into already released games that couldn't be updated. After watching The Wizard I had to have both Mario Bros. 3 and the Power Glove. Other then having to constantly battle with Velcro (my little brothers fault) I was damn well proficient with the glove in many genres and eventually sold it along with every other console and video game I own to purchase a 3DO for $800 when it came out. I think I should of kept the Power Glove. I wish this was a Nintendo item you could get in Animal Crossing New Leaf! DLC please? My buddy has one at his house in a custom display over his TV. This is just proof that Nintendo has always been different. A leader of innovation. Not afraid to change the rules of gaming. Probably unlikely as it's not a Nintendo product. Would look cool though. As the article mentions (though the title doesn't), Nintendo didn't make the Power Glove. I don't think Nintendo actually had anything to do with it. It was manufactured and released by Mattel. @Haywired true! But still Nintendo wasn't opposed to it. And I'm sure used the idea as the foundation for the wii mote. @WiiLovePeace I was waiting for someone to say that lol The guy wasn't wrong, it was bad, but not for the reasons HE said in the movie lol. Aside from Super Glove Ball, I can't remember any other games that used the power glove as advertised. Generally, button combinations were mapped to finger movements, so in order to move left you had to flex your index finger. In order to use the A-button, you had to flex your thumb, etc. It was more like a DDR type of peripheral--not so much like a wiimote. I got the hang of playing R/C Pro-Am on it (made by Rare, 1988-ish), after much trial and error. @Haywired Nintendo may not have made it, but they did absolutely endorse it, judging from The Wizard. "I love the Power Glove. It is a subpar peripheral for the Nintendo Entertainment System, and I like what others don't." @hydeks hahaha yes! That episode was hilarious, he tried to land the plane with everything & finally made it with the power glove. Too funny! I'm up on Triforce's wall. now they need to make one about U-Force. @WiiLovePeace ahaha I wonder if they interviewed that dude from The Wizard. @Funbunz "other than the SMB 3 footage, the Wizard was awful"
@Prizm Hopefully! But probably not, it's just an "indie" movie after all & is now even on kickstarter for $15k.